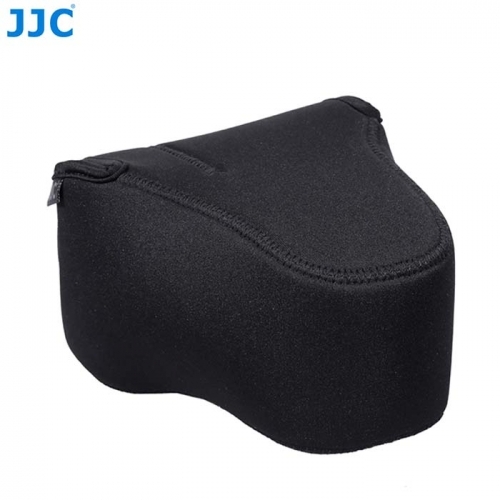 The JJC OC-MC Series Neoprene Camera Cases Stores and protects your camera from dirt, dust, scratches, and light impact. For ease of use, the case is opened and closed with a touch-fastening flap. The easy-access design enables photographers to quickly access the camera. What’s more, the elastic material of the bag makes it fit cameras of different sizes. The case features stylish edge stitching for a handmade appearance, which makes it attractive. In addition, photographers have the option of using this case with or without a neck strap. When removed, the case can be attached to your neck strap through the equipped durable band. OC-MC0GR/OC-MC0YG/OC-MC0BK fits the following models and other cameras with lens no more than 142mm (W) x 100mm (H) x 154mm (D).